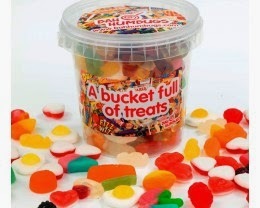 Win a Sweet Bucket of your choice from Bah Humbugs just in time for Christmas! Check out the range of Sweet Buckets they do and if you fancy having one of these to add to a Christmas stocking enter the Rafflecopter form below! And if you cannot wait until the competition ends to try out the buckets or all the other fab sweets Bah Humbugs offer, they are giving my readers 15% discount on ALL products! I loved those strawberry milkshake bottles! My Favourite Childhood Sweet Is The Milk Bottle YUM! Dip dap, nothing beats it !! Shrimps and bananas were my favourite sweets as a kid.i loved popping candy too that was a lot of fun. The pink prawns were my favourite! Refreshers - I'm not sure they taste the same as they used to. Hard to tell. Foam eggs are the best! I loved acid drops. The ones that took the skin off the roof of your mouth. Strawberry bonbons were my favourite childhood sweet. Pineapple chunks were my favourite, I once swapped one for a jellybaby from Doctor Who. Love hearts - always remember them! love hearts, and I love them to this day! white skulls with runny strawberry centres. Those yellow foam bananas...or maybe pear drops! I LOVED Dolly Mixture. I can't stand them now though. Those Cherry Lips that taste like soap. Nutty Logs, does anyone remember them? They cost 2d in the 50's. I always loved Pineapple cubes, recently had a local "old time" sweet shop open up and its fab!